I’ve been dreaming up this quiche flavor combination for quite a while, and my brainstorming paid off in deliciousness. 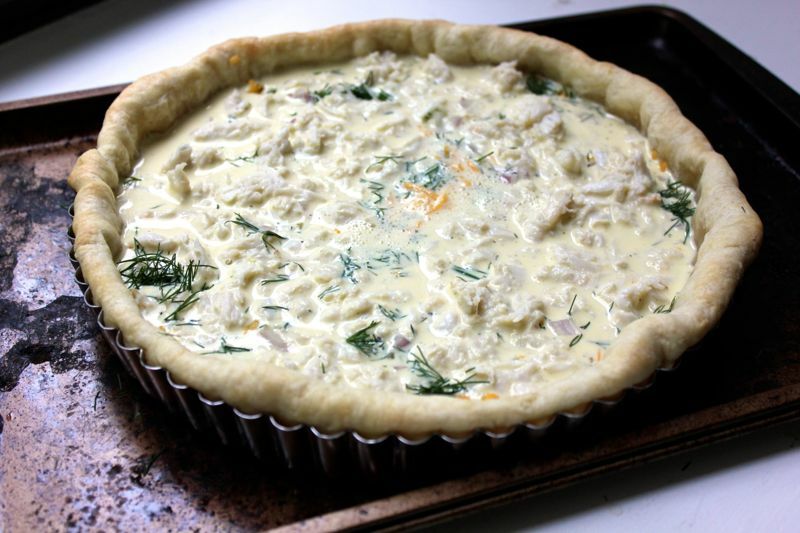 Crab, dill, and dijon mustard marry into an intriguing but relatively light quiche filling, especially when compared to a quiche lorraine. 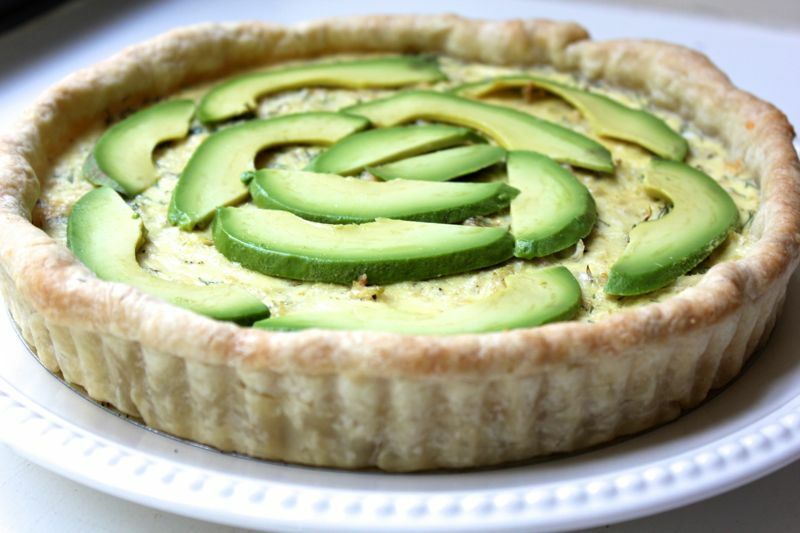 The jumbo lumps of crab meat that peek out from the top of the quiche custard are show stoppers, and an optional avocado array provides a hit of color and added creaminess. I love this quiche so much that I could eat it for lunch three days in a row… again! To make this quiche, get a pie crust and prepare it by baking it, lined with parchment paper and filled with pie weights or dried beans, at 400º F for 20 minutes until it just begins to brown. 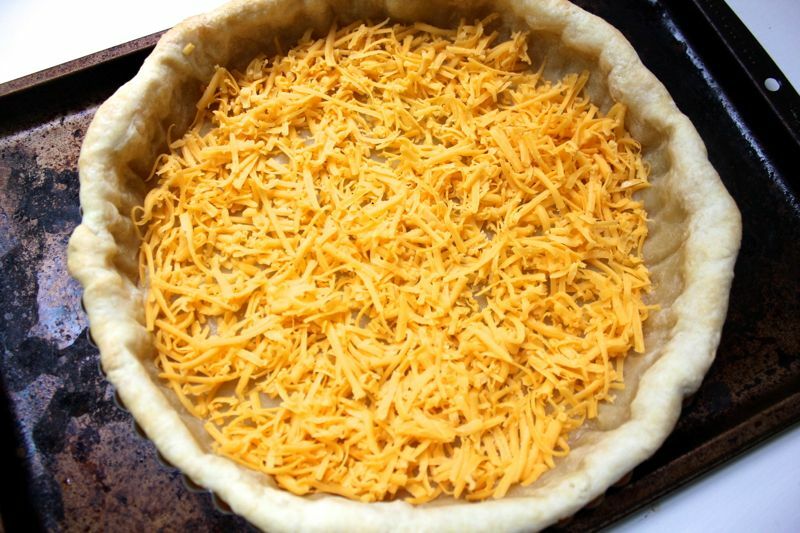 Remove the pie weights and parchment paper, and turn your oven down to 350º F. Grate approximately 1 cup of cheddar cheese, and sprinkle it over the bottom of the crust. Next, sprinkle over about 3 tablespoons of roughly-chopped dill. You should still be able to see a lot of the cheese through the dill- it’s a powerful flavor, and you don’t want it to drown out the crab and dijon. Next, finely dice one shallot, and sprinkle that on top of the dill. The shallot adds a nice crunchiness to the quiche. And don’t forget the crab! Generously bejewel the quiche with jumbo lumps of crab meat. 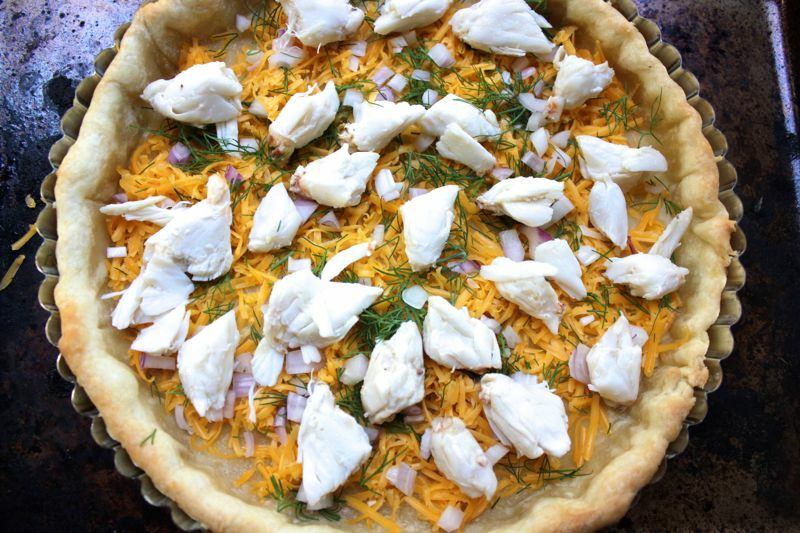 I’ve made this quiche with regular “lump” crabmeat before, and I don’t like it as much. The smaller lumps don’t provide the same visual impact or deliciously firm texture. It’s time to prepare the quiche custard. 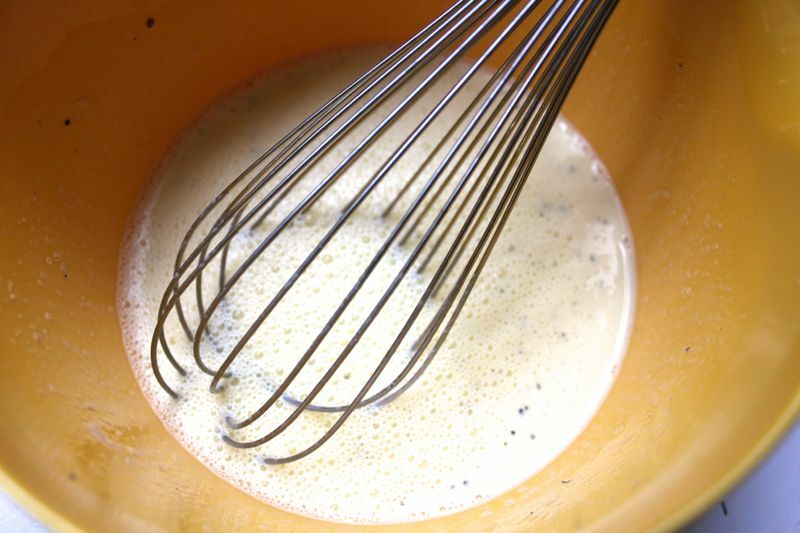 In a medium-sized bowl, whisk together 2 eggs, 1 cup of half and half, 1.5 tablespoons of dijon mustard, and 1/4 teaspoon of salt. Pour the custard into the pie crust, and put the quiche into your 350º F oven. Bake the quiche for approximately 25 minutes until the custard is set (no longer liquid) but still a little bit jiggly. The quiche is ready to serve as is, or you could deck it out in avocado slices. I like the quiche both ways, and, while the avocado version is prettier, avocados’ tendency to brown makes me hesitant to use them if the quiche isn’t going to be eaten immediately. For best results, thinly slice 1/2 of a ripe avocado, and rinse or submerge the slices in cold water. I find that cold water helps to slow the browning process. Pat the avocado slices dry, and then layer them onto the top of the quiche in a nice pattern once the quiche has had a chance to cool. 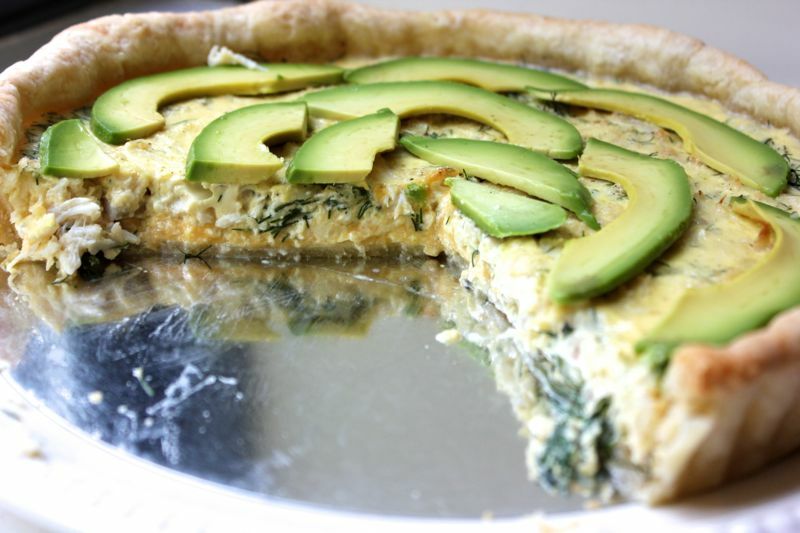 If the avocado is placed directly on a hot quiche, it will shrivel up. I hope this quiche combination makes you as happy as it makes me! Do you have any tips to prevent a sliced avocado from browning?